No, my problem this time is the temptation some may have to turn the Young Avengers into sidekicks for the Avengers. This seems to be the direction things are headed, with Hawkeye pushing the rest of the team to mentor the youths. Don’t misunderstand; giving the Young Avengers lessons in the dos and don’ts of super hero life is fine. But having them tag along behind a particular Avenger on a mission (as Kate Bishop recently did with Hawkeye) is walking into the territory of DC comics. With all due respect, why not make it official that the Young Avengers, while still under the umbrella of the actual Avengers, are not sidekicks? After all, that’s what others did with Professor Xavier’s New Mutants. They were taught at the X-Mansion, by X-Men, but one New Mutant was never attached to one X-Man as a combat partner unless the two teams were in the same fight and battle required it. The same set up could work out this way for the Avengers. The reason I bring this up is sidekicks are to superheroes what adverbs are to verbs: crutches. Adverbs are used to prop up a weak verb. So sidekicks, from time to time, are used to prop up superheroes. This, to me, seems to be another reason why Stan Lee ‘killed’ off Bucky Barnes in the early comics. Captain America was already a strong character by the time Lee made Bucky’s demise official. So if he was always checking on Bucky’s condition or was looking to him for advice every second panel, it would have diminished Cap’s ability to stand on his own. And so, just as Batman frequently has to take care of Robin, Cap would have been in similar situations fairly often with Bucky. Understandably, this would not have worked for Cap. Steve Rogers had to be, and still must remain, a leader in his own right. He couldn’t and can’t keep second guessing himself every few panels, especially not to a fifteen year old boy. It would have been ridiculous and demeaning to the character if Lee had left Bucky in the story. So Stan Lee tossed Bucky out; and Bucky has subsequently returned to the comics as the Winter Soldier, a rather strong character in his own right. Cap and Bucky remain on good enough terms with each other, but one no longer acts as a crutch to the other. The Young Avengers, to my mind, should be given a similar durability test. The Avengers are strong enough that saddling them with a sidekick would be both silly and humiliating. 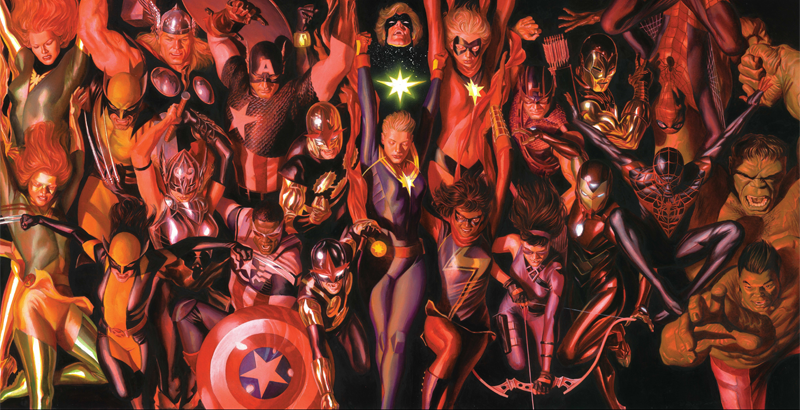 This entry was posted in Marvel Comics' Characters and Stories and tagged Captain America/Steve Rogers, comics, Hawkeye/Clint Barton, James "Bucky" Barnes/Winter Soldier, Jubilee, Kitty Pryde, Marvel Comics' Characters and Stories, New Mutants, Rogue, Shadowcat, sidekicks, Stan Lee, superheroes, The Avengers, the X-Men, Wolverine, writers, Young Avengers on May 5, 2013 by The Mithril Guardian. So on May 3 Iron Man 3 hits theaters nationwide. Kudos to whomever had him bring in all those different versions of the armor; it’s high time we saw them all! But wait. Why should he need those different armors now that he’s getting the Extremis serum? On that point, why did he even get the Extremis serum in the first place? This is hard for me to understand, or even enjoy, really. I always thought that Tony Stark was a great character precisely because he had no superpowers. He wasn’t a mutant, he hadn’t been exposed to any bizarre, deadly radiation; he was just a genius who fought evil in a high-tech suit of armor. In a way, he was like a modern day version of Sir Lancelot or one of the other ancient knights who guarded the great kingdoms in old stories. It didn’t matter what tech or tools he had to work with, whether they were top of the line or rusted hunks of metal from the local scrapheap, Tony could whip up any gizmo from whatever he had to hand. And it would work, often spectacularly, to trounce whatever leviathan monstrosity that Dr. Doom or Kang the Conqueror or, yes, the Mandarin, was aiming at him at the time. No magic tricks, just astounding ingenuity. What a feat to watch (or read)! But, with Extremis, does he even need that anymore? Tony, in the majority of the comics, had to rely on his ingenuity where other heroes and heroines could call on inborn or acquired powers. He didn’t have to use telepathy like Professor Xavier to defeat a bad guy. He just had to out-think him. Tony didn’t need the Hulk’s great strength. The armor let him dish out almost as much punishment as it let him take. He didn’t need Kree DNA in his system so he could shoot laser blasts. He developed flight stabilizers (repulsors) that doubled as neat plasma guns. And they fit right in the palm of each hand!!! Why give him, almost out of the blue, superpowers? Were the sales of Iron Man comics falling that sharply? And if they were, weren’t there better ways of raising them again than altering Iron Man’s star gift? I have heard many times that Tony Stark is popularly assailed by doubts about whether or not it is the man who makes the armor or the armor that makes the man. Really? Without Tony Stark, there would not be any Iron Man suits. And if there were, without a hero to pilot them (and that hero would have to know every system and circuit in the suits like a well-read book) the armors would all be decorating the halls of some billionaire’s mansion as displays of wealth. All this is what Stark could have done. Instead, he chose to use the armors for the greater good, improving them to the point where only the most arrogant villain is unafraid of facing him in battle. And there are still a lot of improvements that could go into future suits. With Extremis, what need would Tony Stark have to focus on those improvements? On that note, why should he wear a suit at all? He could fight, using Extremis, in only a business suit if he wanted to do so. If the mood struck him, he could do it in his pajamas. Why use a metal suit when you can control machinery? And worse, Stark’s not the only hero in the Marvel Universe gaining superpowers. Mockingbird and Winter Soldier (whose only enhancement once was a robotic left arm) have both been given serums that blend Cap’s Super Soldier serum and Fury’s Infinity serum so that they could survive life-threatening injuries. Young Avenger Patriot gained Super Soldier abilities after getting a blood transfusion from his grandfather, a soldier in WW II who was also given a variant of Cap’s serum, for the same reason. Before that he was using enhancement drugs. In the alternate, Ultimate comic line, Hawkeye has been given optical enhancements so that he has the most accurate eyesight on the planet. I see these new ‘enhancements’ only as thefts from the integrity of these heroes. Mockingbird and Winter Soldier won many battles where their super-powered compatriots could not even make slight headway, all for the simple reason that they were ‘normal’ humans. Hawkeye has always been a very gifted shooter; his powers come not from mutant genes or scientific meddling, but from nature. Despite Ultimate Hawkeye’s alternate history and life in the Ultimate Marvel Comics, the fact that he was not born sharp-eyed detracts a great deal from his (admittedly changed) personality. And Patriot? Several heroes in the ‘mainstream’ Marvel Universe, of which he is a part, continue to fight crime with nothing more than finely-honed skills. Why couldn’t he have become Kate Bishop’s equal, fighting crime without powers? Certainly, that would cement any romance blossoming between the two, as it has for other heroes in the past. And it would give him a better standing as well. He would be a ‘self-made’ super hero. 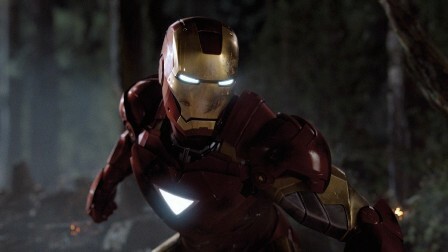 Iron Man was the first, and is the best, self-made superhero. In fact, he was the inspiration for several other Marvel characters to don a costume and fight crime with only their natural skills (just ask Clint Barton). It seems that just as he was the first to become a superhero on his own so he is the first to fall from the humble yet highly honorable position of a self-made hero. And who can say who will be next after Tony Stark; Mockingbird, and Winter Soldier? Jarvis? Kate Bishop? J. Jonah Jamieson? Flash Thompson? Maria Hill? Yes, Extremis is an amazing advantage. But the more amazing and the better advantage was Tony Stark’s boundless resourcefulness. Until it returns, it will be a talent sorely missed by many Marvelites, my fellow writers. This entry was posted in Marvel Comics' Characters and Stories and tagged Bobbi Morse, Fantastic Four, Hawkeye/Clint Barton, Iron Man, Marvel Comics' Characters and Stories, Mockingbird, New Mutants, self-made, superheroes, The Avengers, the X-Men, Tony Stark, Young Avengers on April 26, 2013 by The Mithril Guardian.